Gott Heart Art: Sand Castles! I had a lot of fun with this card. I dyed my White Gala Glitz Art Glitter with Walnut Ink Tintz Tea Stain so I would get some shiny sand. Embossed the shells across the middle with tea dye Distress embossing powder so it would feel like sand. Colored my image with Copic markers, I'm kind of getting the hang of it. You can't really tell it in the picture but I accidentally picked up a piece of Shimmery White card stock in stead of Whisper White, so my girl has a sparkly tan in just the right light.Then I found these 2 little charms in my stash and Wah Lah I think just the right finishing touch. 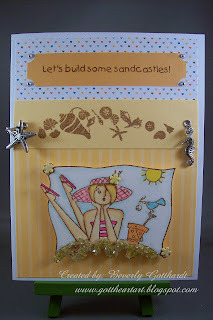 Creative Inspirations Challenge 63-Beach Theme! Raise The Bar Challenge #21-Celebrate Summer! Supplies: White Card Blank 5" X 6 1/2" Halcraft, Papers: Stampin Up-Shimmery White, Welcome Neighbor Designer Series Paper Pad, Patterns Pack II, Apricot Appeal, Stamps: Shirley's 2 Girls-Mazie at the Beach, Inkadinkado-97521 Coastal/Maritime, Ink: Ranger Archival Ink-Coffee, Copic markers, Fiber Scraps-walnut ink tintz tea stain, Barbara Trombley's Art Glitter-White, Ranger Distress embossing powder-tea dye, Michael Richard"s-metal dots, silver cord-Hobby Lobby, eyelets-unknown, charms-unknown, Stampin Up-ticket punch, pop dots. 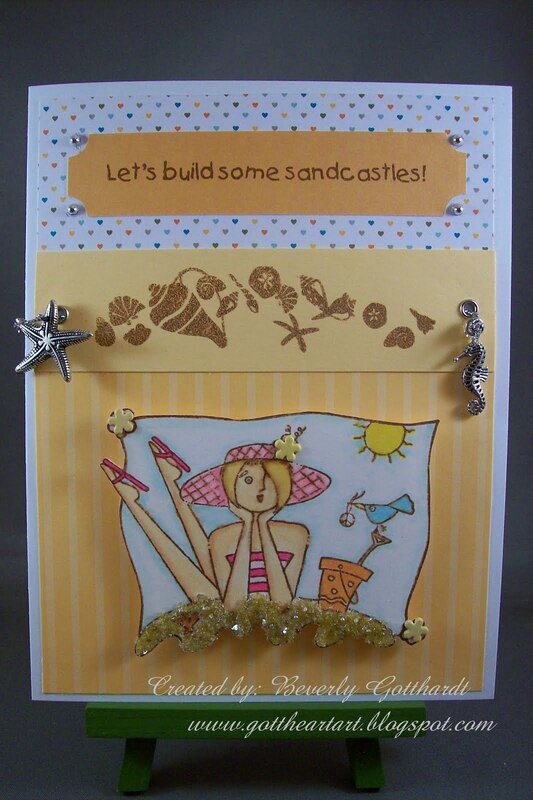 Love this card, a great scene and the extra texture. Smashing. Love the seashell stamp. I think I've gotta have that. Great card for our Summer challenge. Thanks for playing along at Raise the Bar. Great job on the coloring, you definitely are getting the hang of it. It is a cute summer card. Thanks for playing with the diva sketch! WOW this is so sweet! Thanks so much for joining us at Raise The Bar! Hope you will join us again!